Posts in the Stilus blog related to automatic proofreading. La Federación Española de Sociedades de Informática (SCIE) otorga el Premio Mare Nostrum 2015 a s|ngular Meaning. Se la reconoce como referente tecnológico y empresa española líder en la creación de software para extraer el significado de todo tipo de contenido multimedia. Este premio se concede anualmente a una empresa consolidada en el ámbito de la ingeniería informática. Se valora el dinamismo y el impacto nacional e internacional de la misma, así como su apuesta por la I+D+i. Entre los productos de la compañía, el jurado destaca Stilus como una tecnología dirigida a profesionales de la lengua y a aquellos interesados en producir textos de calidad. Pero además de medios de comunicación y editoriales, s|ngular Meaning tiene clientes en otros sectores como el financiero y el farmacéutico donde aplica con éxito su tecnología lingüística de búsqueda y extracción de información. Recently, the company Daedalus has released a new version of Stilus, its tool to proofread spelling, grammar and style in Spanish. Innovations include Stilus Macro for Word, a new add-in that enables to autocorrect hundreds of thousands of context-independent errors at the push of a button. 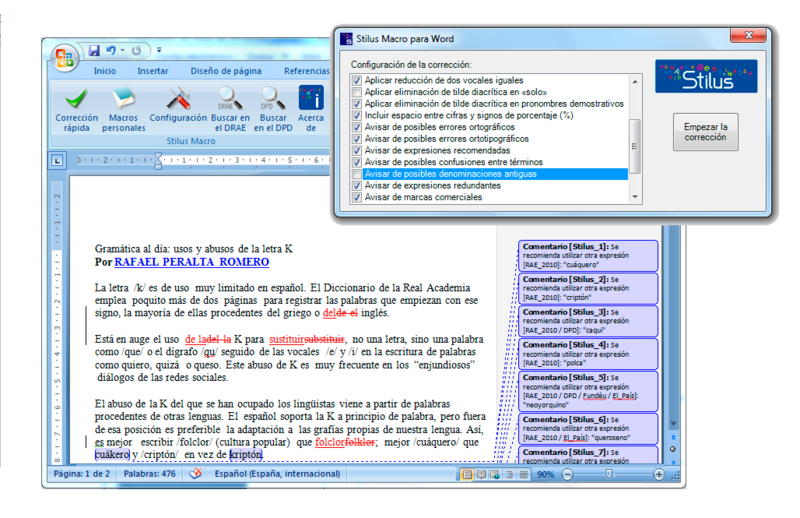 Stilus’ contextual and semantic technology for proofreading texts in Spanish has enabled to isolate hundreds of thousands of context-independent writing mistakes. The automated correction of this type of “safe errors” not only speeds up the first phases of the proofreading of orthotypography and style, but also carries it out with a very high precision. This is the reason why Stilus Macro for Word is the first add-in of Stilus that not only checks a text, but also performs actions directly on it. Under the slogan: “Tus palabras son tu imagen” (“Your words are your image”), the Third International Conference on Spanish Language Proofreading (3CICTE) was held in Madrid on October 24, 25 and 26, promoted by La Unión de Correctores de España (UniCo), a well-known Spanish association of proofreaders. The conference, preceded by the ones celebrated in 2011 in Buenos Aires (Argentina) and in 2012 in Guadalajara (Mexico), exceeded 250 attendees combining professionals, speakers and organizers. The last weekend, in Madrid, Casa del Lector was the best scenario to celebrate Lenguando: the first national meeting on language and technology. The pioneering initiative, brought successfully to reality by our colleagues at Molino de Ideas, Cálamo & Cran and Xosé Castro, was driven, among other sponsors, by Daedalus‘s Stilus. The spirit of the conference was to bring together in the same space translators, proofreaders, philologists and other communication and language professionals, with an emphasis on the technological revolution of the sector, among other issues. The talks about the advances in language technology and the simultaneous workshops on their practical application were the most anticipated. In particular, the workshop given in the main auditorium by Concepción Polo (who’s writing this post) on behalf of the team of Stilus was one of the most anticipated by the attendees, according to the organization. With the intention of presenting innovative content and above all practical, in the workshop we considered the possible applications of Corpus Linguistics (CL) in the specific area of professional automatic proofreading.